It may be obvious to point out with the form this man has shown in recent weeks but Tevita Pangai Junior is our Future Star Of The Week. Here’s everything you need to know about the NRL star. Pangai Junior was born in Ashfield, New South Wales, Australia, and is of Tongan descent. He moved to Newcastle, New South Wales at a young age and played his junior rugby league for the South Newcastle Lions in the Newcastle Rugby League, before being signed by the Newcastle Knights. Pangai Junior is the younger brother of former North Queensland Cowboys player Mosese Pangai. After playing in the lower grades at the Knights, Pangai Junior joined the Canberra Raiders in 2013 and played for their NYC team from 2013 to 2015. On 7 November 2013, he re-signed with the Raiders on a 3-year contract. 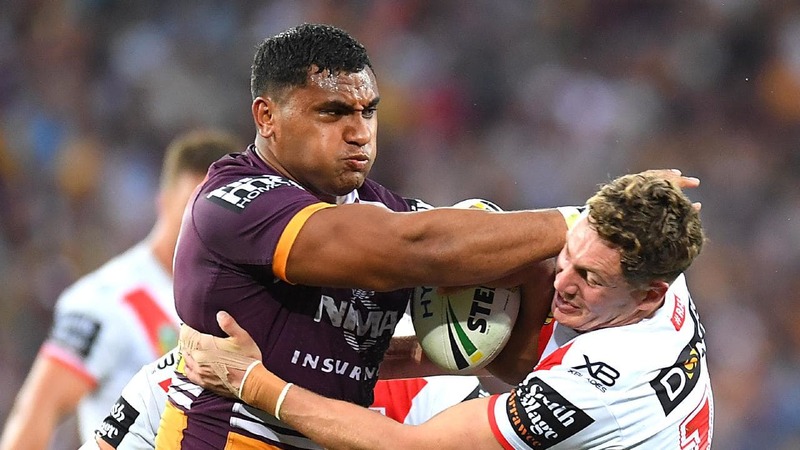 In January, Pangai Junior signed a 2-year contract with the Brisbane Broncos starting in 2017, however, in February, he was granted a release from the final year of his Raiders contract to join the Broncos effective immediately on a revised contract for just the 2016 season. It was in Round 12 of the 2016 NRL season, he made his NRL debut for the Broncos against the Wests Tigers, playing off the interchange bench in the Broncos’ 19-18 loss at Suncorp Stadium. In Round 13 against the New Zealand Warriors, he scored his first NRL career try in the Broncos’ 36-18 loss at Mt Smart Stadium. He finished his debut year in the NRL having played in 14 matches and scoring 2 tries for the Broncos in the 2016 NRL season. On 22 September, he re-signed with the Broncos on a 2-year contract until the end of 2018. Pangai Junior suffered a finger injury during theBroncos’ local derby clash against the Gold Coast Titans in Round 7 and it wasn’t until Round 13 that he returned. The emerging star finished the 2017 NRL season with him playing in 18 matches for the Broncos. After showing a good performance in Round 1 against the St George Illawarra Dragons as the Broncos lost 34-12 at Jubilee Stadium. The Queensland derby match in Round 2 against the North Queensland Cowboys, Pangai Junior had a monster performance, scoring a try out of sheer strength, nearly scoring a second identical try but was disallowed. As Pangai Junior was showing himself as the standout forward for the Broncos, he was under consideration for the New South Wales State of Origin squad, but he opted to stay loyal to Tonga to represent his family but later didn’t take part in the Pacific international against Samoa due to injury. Pangai Junior would finish his best season to date, playing in 22 matches and scoring 5 tries for the Broncos. Tevita has had a dream start to this season with 39 tackles, 1 try and over 260 running metres. Tevita is a Bachelor of Commerce student at university.